Starting with churning clouds of molecular gases after the Big Bang, gravitation—or the mutual attraction among objects of matter—influenced the formation of the galaxies, stars and planets within the Universe. The gravitational force is also responsible to the shape of the stars and planets, as well as many other objects in space. The initial motion of all the material in the Universe was later affected by gravitation, resulting in the rotational motion of the galaxies and in the orbits of the planets on our Solar System. What role did gravitation have in forming galaxies and stars? Why are stars and planets round? How objects in space interact? Scientists believe that at about 300,000 years after the Big Bang occurred, the Universe consisted of molecular clouds of ionized gases. 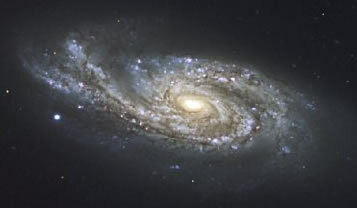 Gravitational forces caused clumping of this churning matter until at about 500 million years later, when large, distinct quantities of matter gathered as the beginning of galaxies. From about 1 billion years after the Big Bang, gravitational forces pulled matter within the galaxies together, forming stars. Because of the large amount of matter in a star, most of it never cooled off. Thermonuclear reactions have kept the stars at extremely high temperature over the eons. The galaxies and stars continued to evolve until around 9 billion years, when our Solar System was formed along with its planets in motion around the Sun . The gravitational attraction during the formation of stars and planets caused them to take on spherical shapes, which is the most efficient shape for evenly distributing the gravitational force among the object's mass. However, rotation of these bodies on their axes as they cooled often resulted in a bulge at their equators due to centrifugal force. The equatorial radius of the Earth is 6,378.1 km, while its polar radius is 6,356.8 km. Since the Sun revolves so slowly and its mass is so large, the bulge at the Sun's equation is negligible compared to its overall size. Since galaxies are so spread out and consist of gases and stars, the gravitational forces have not been sufficient to pull most of them into even close to a spherical shape. Smaller objects, such as asteroids and meteors were typically not formed from solidifying liquid and thus are often not spherical in shape. Objects in space are constant motion. Besides causing quantities of matter to gather together to form suns, planets and moons, gravitation also causes these moving bodies to interact with each other. If the paths of two speeding objects in space intersect, they will collide or spiral into each other. The craters you can see on the surface of the Moon are from objects smashing into it. On a larger scale, suns have even collided. However, if their paths of motion simply go near each other, the bodies may go into orbit around the center of mass between them or even "slingshot" off into space, depending on the masses, separations and velocities. Circular or elliptical orbits are seen with moons are planets, planets around their suns and suns or stars in orbit around the center of their galaxies. In some cases where the objects are close to the same size, they can revolve around each other. Astronomers have seen a number or double or binary stars that are in orbit around each other. If the relative velocity between two objects is great enough, one will pass by and go off into space in a parabolic or hyperbolic path. Gravitation keeps the Moon in orbit around the Earth. Since the Law of Inertia states that objects in motion tend to go in a straight line, the force of gravitation between the Earth and the Moon prevents the Moon from continuing in a straight path. It is somewhat like the effect of a string on a weight that you swing around you. Once you let go, the weight no longer goes in a circular path but instead flies out away from you. Likewise, the Earth and other planets are in orbit around the Sun, and the Sun is in orbit around the center of the Milky Way galaxy. After the Big Bang, gravitation influenced the formation of the galaxies, stars and planets within the Universe. Gravitational force is also responsible to the shape of stars and planets, as well as many other objects in space. The initial motion of all the material in the Universe was later affected by gravitation and resulted in the rotation in galaxies and revolution of planets on our Solar System.